Serbian President Aleksandar Vučić has never ran from journalists’ questions. It’s a completely different thing whether the journalists like his answers. 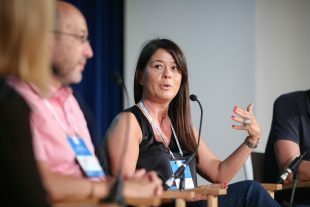 The journalists’ problem is that Vučić says what he means, stated Suzana Vasiljević, Media Advisor to Aleksandar Vučić at the “West Wing – How to Advise the President” panel. She claims that she never determined which questions the journalists can ask and she never censored media releases in Serbia. ‘President Vučić has never conflicted with anyone. It’s always just an exchange of opinion, and it is the same regarding Croatia. It’s ugly that Kosovo is trying to turn into a regional problem. The citizens of Serbia expect a miracle in regards to Kosovo, but that miracle does not exist, and we don’t want to give the citizens false hope”, said Vasiljević. Krešimir Macan, former advisor to Croatian Prime Minister Andrej Plenković, is not happy how everything worked out in that position, he considers planning to be the main problem. “You have to have a plan, set the topic of the week, and stick to it, and answer to other issues along with the main topic, and not let the media dictate what you’re talking about,” Macan said. He compared media advisors to former court jesters, who spoke to rulers openly and said event things the ruler disliked. Strategic consultant Stojan Pelko, who led the campaign of former Slovenian Prime Minister and current Foreign Minister Miro Cerar, considers the direct contact with the presidents the most important because otherwise, consultants will lose themselves in various court affairs. ‘It makes sense to run for elections only as a challenger. It’s always easier to sell a new face in politics than to win the elections again, “Pelko said. A good example of this is the former comedian, the new Slovenian Prime Minister Marjan Šarec, who managed to capitalize earlier unexpectedly good results in the presidential election. Other parties in the coalition supported him, Pelko said, because they didn’t want the right-wing leader Janez Jansa come to power.